"More recently, artists represented by Bankside curator Contemporary Collective, including Helen Gorrill and Victoria Heald, have been added to its roster of talent. The acclaimed Gorrill, who describes her work as “vandalizing old masters and reviving art historical portraits through photobombing and incorporating elements from contemporary subculture” submitted three portraits to Bankside’s gallery. 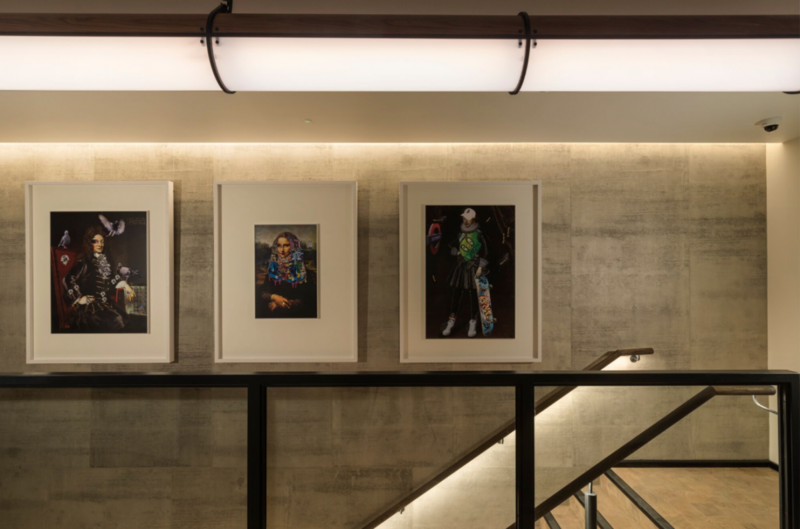 In the works, Gorrill has drawn inspiration from the hotel’s South Bank ‘hood and the staff of the property itself, incorporating their features into the portraits that represent Mona Lisa, Shakespeare, and Sir Christopher Wren. 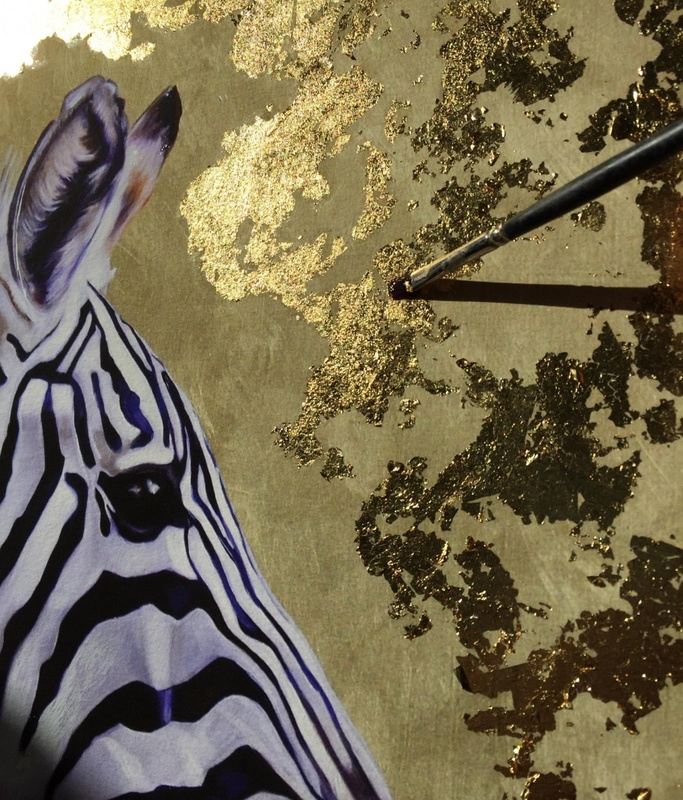 For her residency starting this summer, the London-based Heald will host an artist talk about her experience in the industry and an event on using gold leaf as a technique in art, which she is well accomplished in." 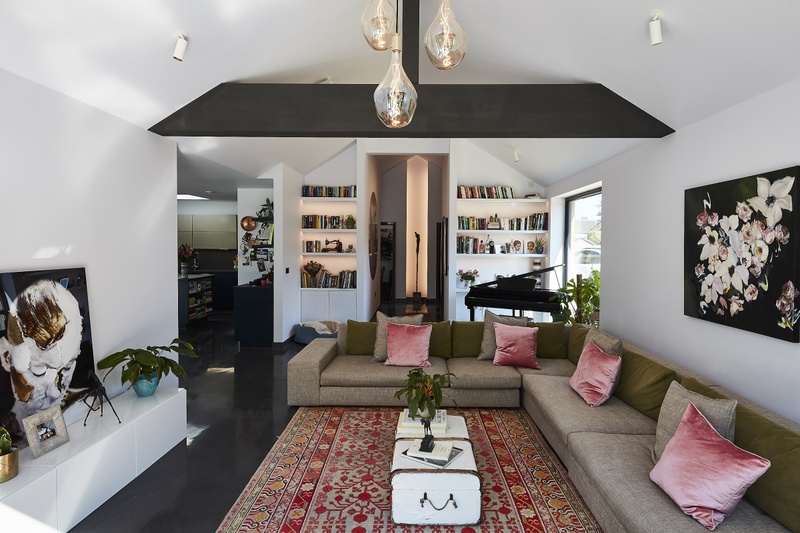 Grand Designs TV house: look inside Britain's first hypoallergenic home For the first time in Grand Designs TV history, Kevin McCloud followed Elinor and Born Barikor on their self-build journey to creating a healthy home. Take a look at the key features that ensure their project is a truly healthy building. Hereford College of Arts BA (Hons) Fine Art Graduate Tottie Aarvold has been included in a shortlist of 21 artists for The Signature Art Prize 2018/19. By Chris Leadbeater, 9 November 2018 | Gorrill is represented by the Contemporary Collective – an art gallery born into the creative swirl of Hackney, east London, in 2006, and now based at Somerset House on the Strand. It has made a mission statement of “supporting young artists in the emerging stages of their careers, to provide them with meaningful exposure and access to the market place and collectors”. It will curate the hotel as, effectively, an extension of its own space, filling its walls with the paintings and visions of talented individuals. Londoner Luke Walker is already notable by his presence. It is his dramatic, lined representations of structures in the capital – produced by applying paint with thin strips of masking tape – that illuminate the alcove next to the lifts on the ground floor. The city come within. The hotel has also partnered with Contemporary Collective to run a rolling "Maker in Residence" program. There's an on-site artist studio, located on the ground floor of the hotel, which will provide emerging artists space and opportunity to showcase their work. Contemporary Collective's current "Maker in Residence" at Bankside Hotel, Victoria Heald, is delighted to offer a gold Leaf Art Workshop in the dedicated Artist Studio at the hotel.The workshop will run for 2 hours from 10 a.m.to 12 p.m. During the workshop Victoria Heald will talk briefly about her work and the residency programme at Bankside Hotel. 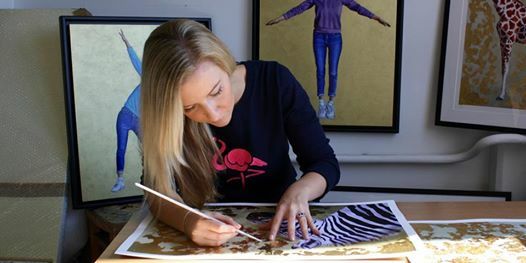 Current artist in residence at Bankside Hotel, Victoria Heald, is hosting an intimate gold leafing masterclass for art-lovers of all abilities this Saturday. Following a brief talk by Heald, attendees will learn how to embellish art using gilding paste. 100% of the profits raised will be donated to David Shepherd Wildlife Foundation. 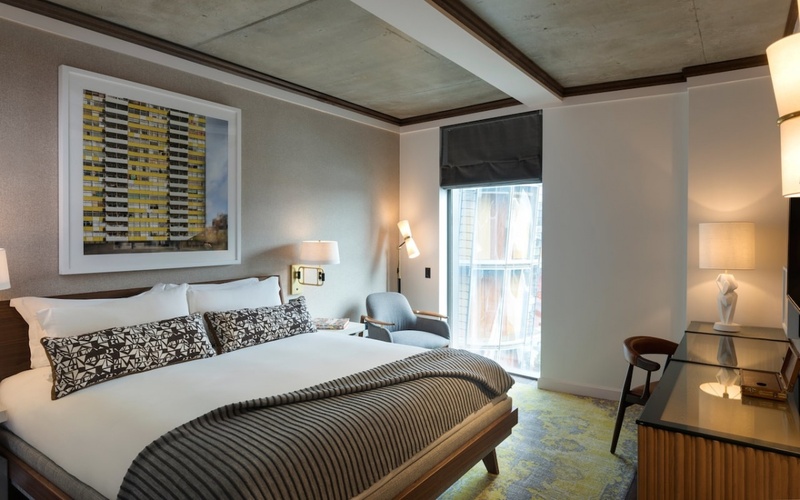 Opened six months ago, Bankside, a design-forward hotel on the South Bank of the River Thames in London, has revealed its schedule for its Maker-in-Residence program, a rotating series of artists and workshops taking place in its ground-floor Makers Hub. Reflecting the hotel’s commitment to the vibrant creative district in which it resides, Bankside partnered with Contemporary Collective. The first in what will be a rotating cast of Makers in Residence is London-based contemporary artist and urban landscape painter Luke Walker. The Bankside also commissioned Helen Gorrill, a portrait artist represented by the Contemporary Collective, an online gallery featuring emerging artists, to create three portraits of people with a connection to the area. 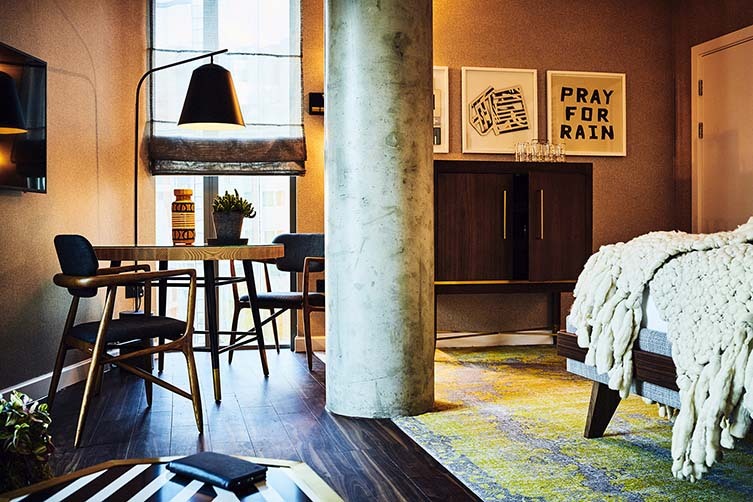 Reflecting the hotel's commitment to the creative area in which it resides, Bankside has partnered with Contemporary Collective to run a rolling Maker in Residence programme. This permanent space offers emerging artists the opportunity to showcase and create work just a stone's throw from the Tate Modern. 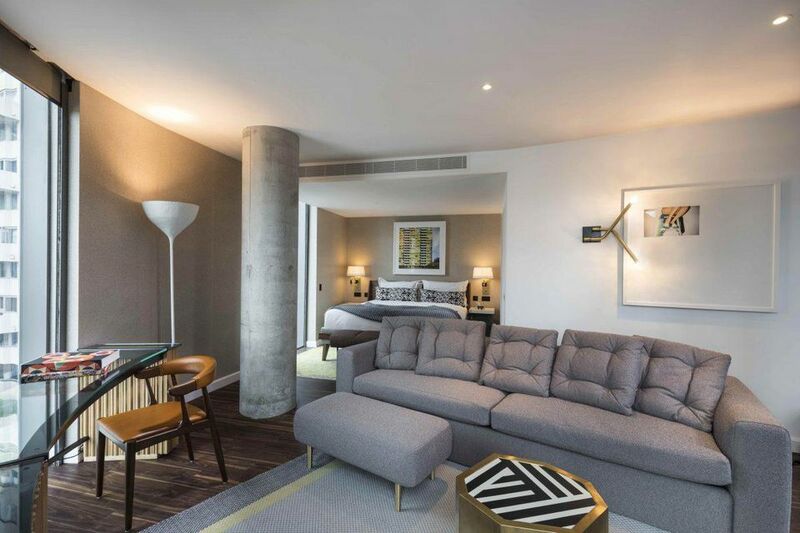 With easy access to the Tate Modern, Borough Market, and Somerset House, the new design-led Bankside Hotel combines the influences and culture of its surrounding neighbourhood with genuinely friendly service, art-informed interiors, and a commitment to be regarded as ‘the’ social hub for guests and locals with a penchant for style. A dedicated area of the hotel is home to a ‘Makers in Residence Craft Space’ where, in collaboration with Contemporary Collective, an ever-changing programme of creatives covering a range of disciplines will have the opportunity to practice their craft; guests having the pleasure to watch an artistic journey unfold throughout their stay. 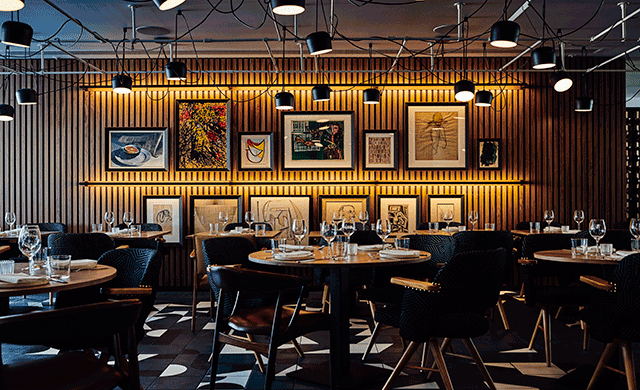 The design reflects the history of South Bank through an art school-inspired lens. 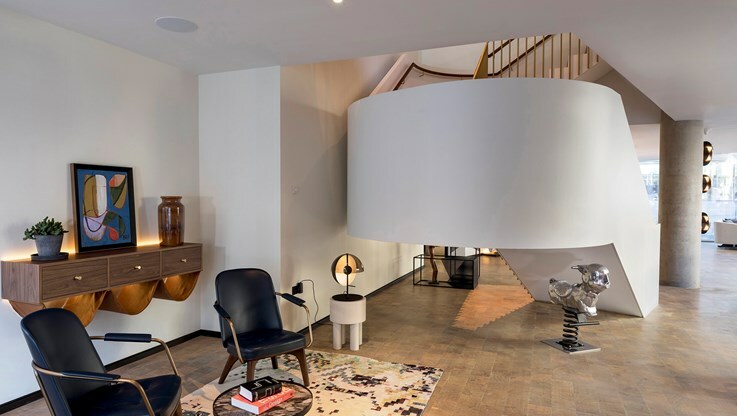 British craftsmanship is also showcased across the interior with furnishings from local ceramicist Laura Carlin and artist and designer Malgorzata Bany, who crafted side tables cast from Jesmonite in homage to columns used to support buildings above water. Online art gallery Contemporary Collective has also launched the Maker in Residence program at the hotel. 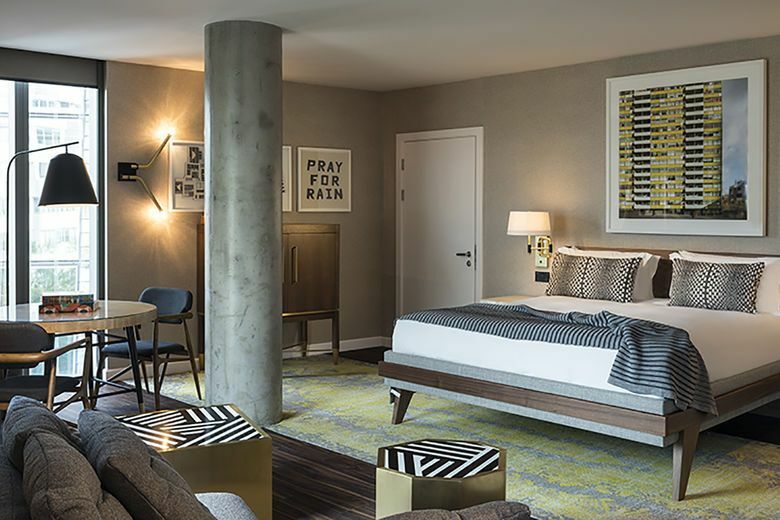 Underscoring the hotel’s commitment to the creative area in which it resides, Bankside has also partnered with Contemporary Collective to run a rolling Maker in Residence program. This effort will include a permanent space offering emerging artists the opportunity to showcase and create work just a stone’s throw from the Tate Modern. For woven pendant lights in a pod-like style, try Louise Tucker. Gray Concrete could make a table like this. 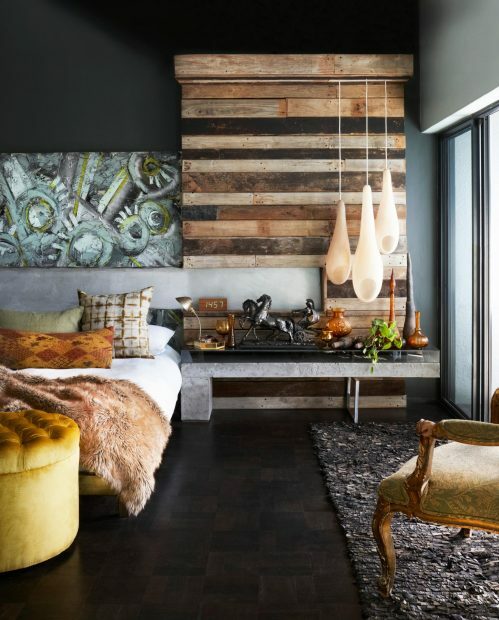 The ottoman is from DAG in Cape Town. Head to George Smith for similar. The painting was knocked up by home owner. 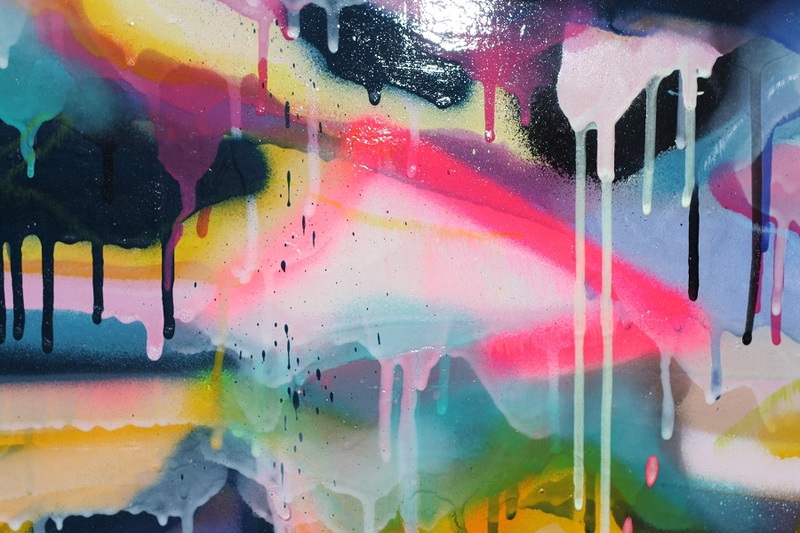 Try degreeart.com for similar artwork.